McMillan Shakespeare Limited (MMS) is one of Australia’s leading providers of salary packaging and novated leasing services. They are also industry experts in fleet and asset management. Money Now are a new subsidiary of MMS and a consumer finance business that principally deals with small to medium loans. These loans are often marketed for vehicles, but can also be applied to small businesses and other personal item. Initially, Money Now engaged us to do a website UX review. However, after commencing the review, proving our in-depth understanding of the business, and sharing our improvement recommendations, we were asked to provide a full end-to-end website redevelopment, spanning user research, UX workshops, and design, development, and hosting. 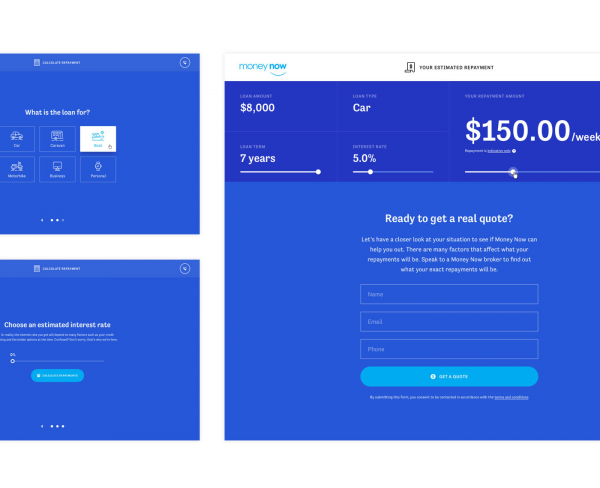 The hero of Money Now’s new website is an affordability calculator which allows users to project repayment fees and schedules, and has proven to be a powerful trust builder and qualified lead generator. The client was so pleased with the calculator we designed they asked for it to be built as a standalone Ember application to allow MMS to re-skin the calculator and use it for other subsidiaries. We had to work within a short timeframe to build the product and merge both applications, but our successful delivery has benefitted both Money Now and the broader MMS group of companies. For the full website development project, we were tasked with designing a responsive website that would build trust with prospects and, ultimately, collect leads. 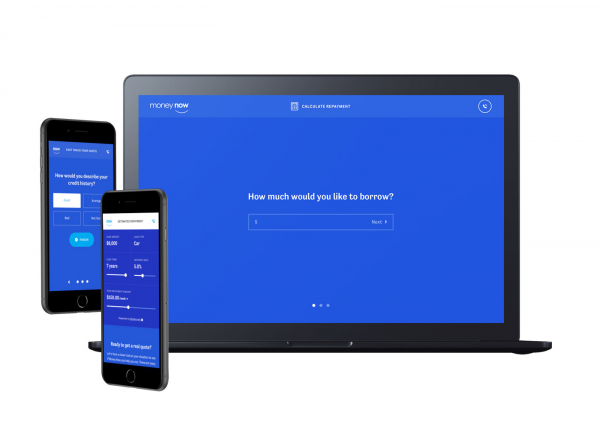 The team at Money Now envisioned an interactive calculator tool that would produce estimated repayment fees/schedules, encouraging the user to then submit an enquiry to speak directly with a Money Now representative. Conversion rate optimisation (CRO) was a primary consideration for this website, with a series of macro and micro goals. The former concerned increasing website enquiries, improving customer journey satisfaction, and lifting end of lease sales, whereas micro goals included building out an email prospect list of potential customers for future marketing efforts, increasing brand awareness and affinity, encouraging calculator usage, and creating engaging thought leadership content. 4. Provide users with an easy way to access repayment estimates and formal quotes. A review of competitor websites revealed an opportunity to design and implement an ‘affordability’ calculator in a way that would set Money Now apart from similar businesses active in the marketplace. Further, the website needed to function as a one-stop-shop for information about the business and its service offerings, and provide users with valuable, content-rich resources. User research revealed important insights about Money Now customers: namely, there is variance in how familiar or comfortable users are with loans, but on the whole they expect a quick turnaround on general enquiries and application decisions. 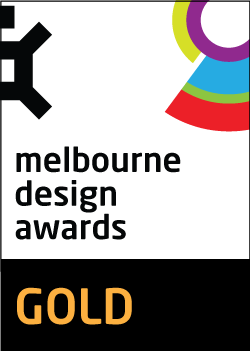 Positive, professional rapport with brokers and affordability also factored into the website’s final design. To emulate the hands-on, friendly experience customers enjoy when visiting one of Money Now’s brick and mortar locations, we engendered trust by introducing key staff members and prioritising information about Money Now’s local, personal approach. Because Money Now’s USP is that customers can easily access loans at affordable rates, we gave prominent feature to the affordability calculator throughout the website. On click, users input their goal and expected interest rate to estimate repayment schedules/fees. Following this, users are prompted to obtain a full quote from a Money Now representative. Building the process out this way provides Money Now staff detailed lead profiles to then use to convert into sales. 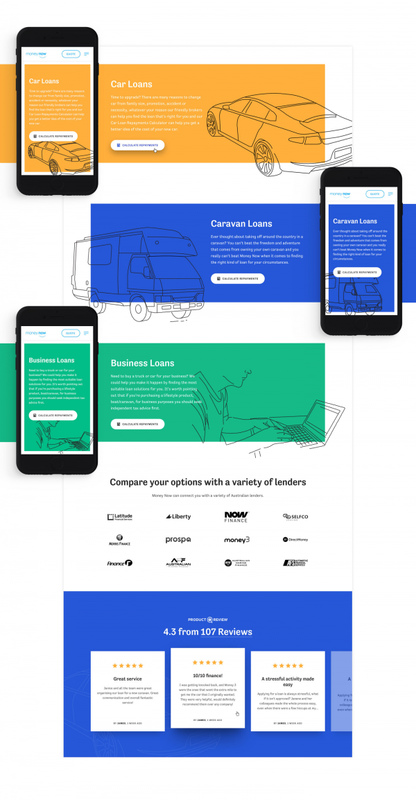 To deliver on Money Now’s website redevelopment brief, we created landing pages that correspond to the business’s different loan types; these pages feature multiple pathways through to both the affordability calculator and Submit a Quote forms. 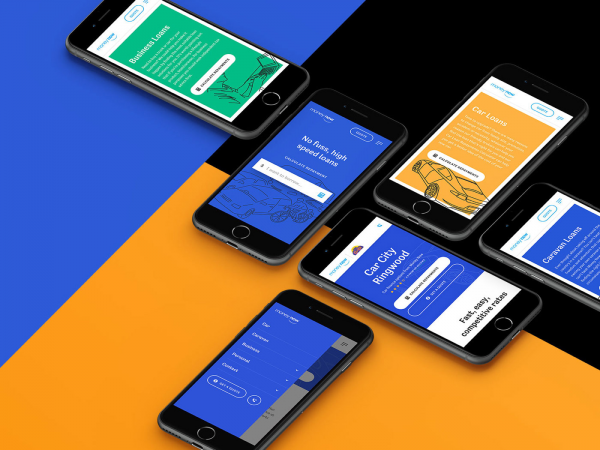 We took care to make these forms immersive by spanning the full screen width, removing unnecessary or distracting content, creating smooth page transitions, and building large tap/click states for form fields and buttons. Because Money Now has internal SEO and marketing capacity, our engagement from a marketing perspective was limited to a core launch optimisation and consults and recommendations throughout the project concerning tracking and keyword optimisation.